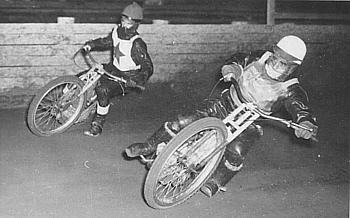 Kaye Andrew, Lionel's daughter, too young at the time to remember her Dad's ' hey days of Speedway ' has proudly supplied us here on 'Just Solos ' with a small collection of photos from his career. Also included are some photos courtesy of the Molly MacPhee Collection. 10th February 1968 aged 51....Thank you Kaye for these pics. 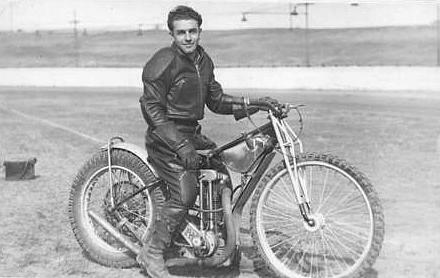 A Frank Le Breton photo of Lionel, on the infield of the Sydney Sports Ground Speedway in 1946. This pic appeared on the cover of the SSG programme with a caption of ' Laurie ' Levy. 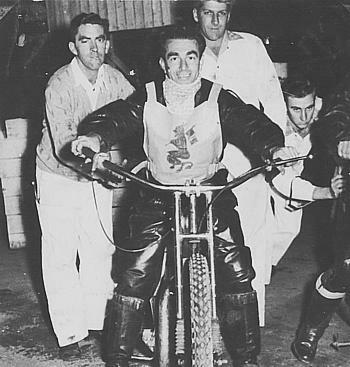 Lionel, also know as ' Porky ' Levy, wearing the Aussie Test jacket. 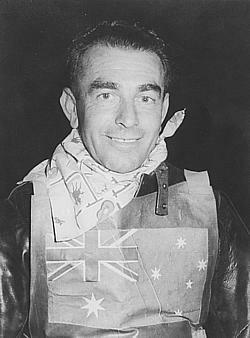 He was always a top point scorer in later years in his test appearances for Australia. 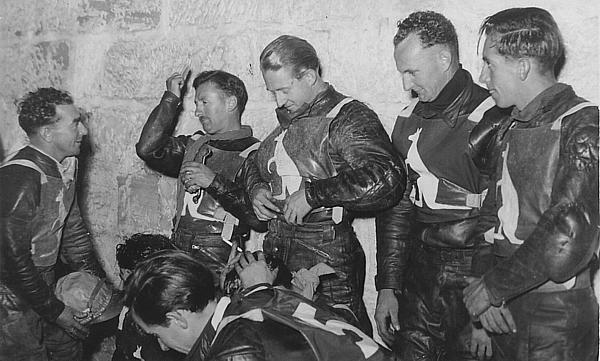 A group of top Aussie riders ' shoot the breeze ' at the SSG early 1950s. 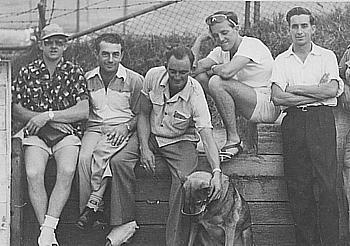 L to R: Graham Warren, Lionel, Jack Gates & dog with sun glasses on, Arthur Payne and Keith ' Buck ' Ryan. A great action shot of 'Porky' on the outside of the great Aub Lawson, SSG early 50s. You can see the small stature of Lionel in this pic.. 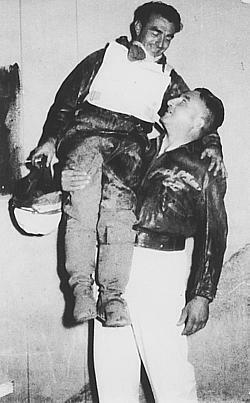 He made up for his size with incredible strength and determination and of course..talent.. 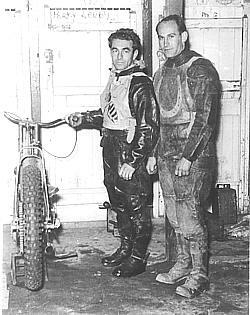 In the pits during a U.K. league match in the 50s, Lionel in his Coventry race jacket with fellow Austalian Lionel Benson who rode for Leicester.
' 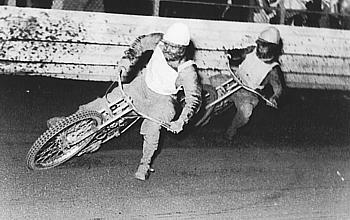 Big ' Jack O' Dea, Victorian speedcar driver hoists Lionel up onto his shoulder without much effort at all. 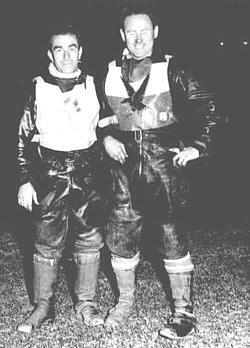 Lionel with fellow Aussie rider Hughie Geddes, who was riding for Exeter..
An Aussie test team line up..1st. test 1952. 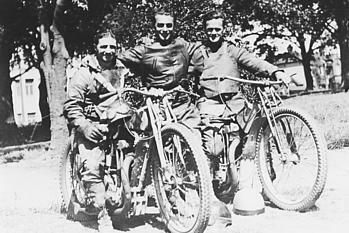 Back Row: Jack Chignell, Allan Wall, Cec Weatherby(Man.) 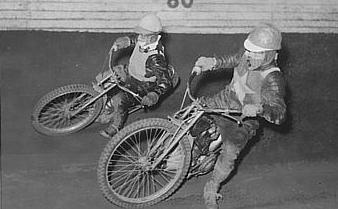 Arthur Payne, Noel Watson. 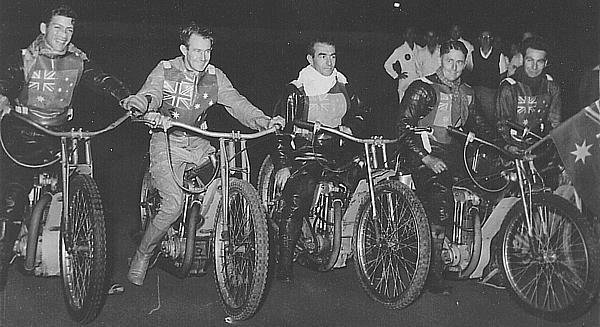 Front Row: Keith Ryan, Aub Lawson, Lionel, Don Lawson. 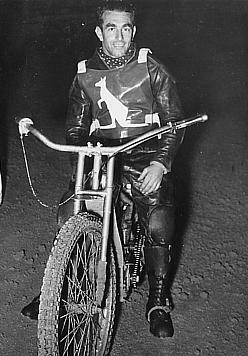 Lionel with 14 points, was second top scorer to Keith Ryan on 16. Lionel had a quiet night with 9 points earned. 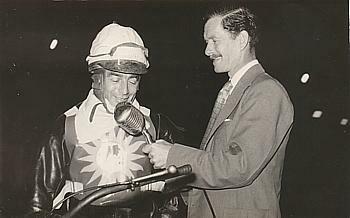 Lionel , in Aussie test jacket, holds the inside line on the mighty Jack Parker. 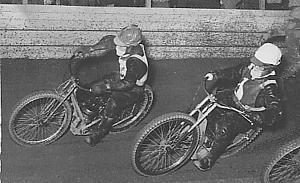 Like most riders of the era Lionel looked upon Parker as the man to beat. 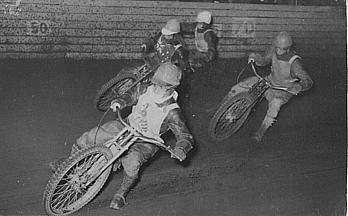 Lionel heads Aub Lawson, Keith Ryan and Ken le Breton at the the SSG. Lionel riding outside Aub and inside Swede, Rune Sormander, SSG 1954. 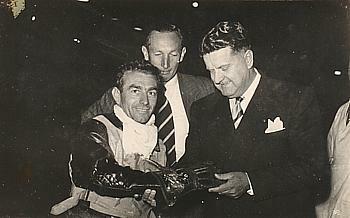 A presentation of a Golden Guantlet for Lionel at the Exhibition Speedway, Brisbane, with the man in the centre, Frank Arthur who gave Lionel his start at the Royale in 1937..
Lionel, wearing a World Final qualifying round race jacket, is interviewed by well known Speedway personality, ex rider and Speedcar driver, Bill Reynolds. Lionel on the inside during one of his many tussles with Aub Lawson. 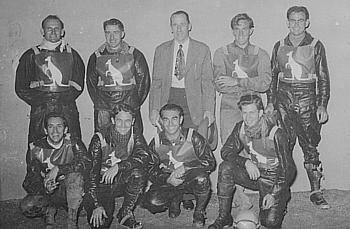 Later in his career, Lionel rides inside popular Sydney rider Brian Collins. Looks like Lionel is commenting on Bill Longley's hair style here in this pre test pic. Kneeling in front: Jack Biggs. 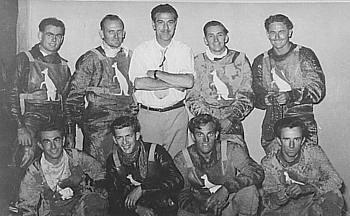 Early in Lionel's career,from left, Bobbie Hibbert, killed at the SSG on 10.5.46, Lionel and Ernie Brecknell. Ready to be pushed out at Cumberland Oval, Parramatta..
Allan Wall leads Lionel at the SSG. 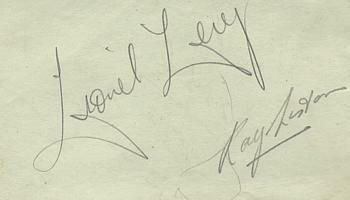 Lionel had a nice hand (in writing), he signed this for me at the SSG in the 1950s. ( Brian ). 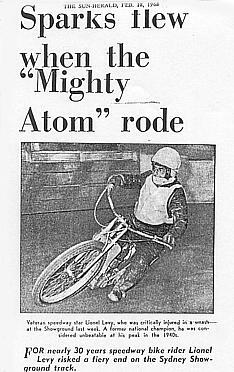 Ray Liston a fellow rider also on the page. 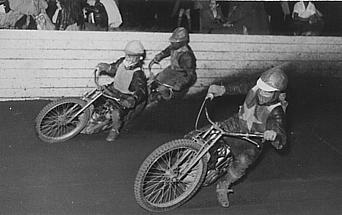 Probably one of the last photos taken of Lionel in action during his 1967 comeback. 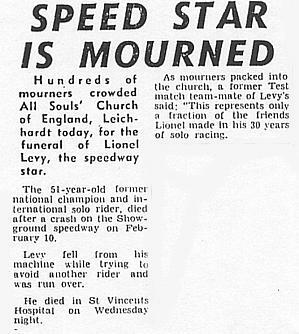 This article relating to his, to be, fatal accident was written in the Sun Herald on February 18th 1968. A final tribute to Lionel from his friends. A great photo of Lionel representing his country. Photo courtesy of Mike Kemp. U.K.